In today’s housing market, where supply is very low and demand is very high, home values are increasing rapidly. 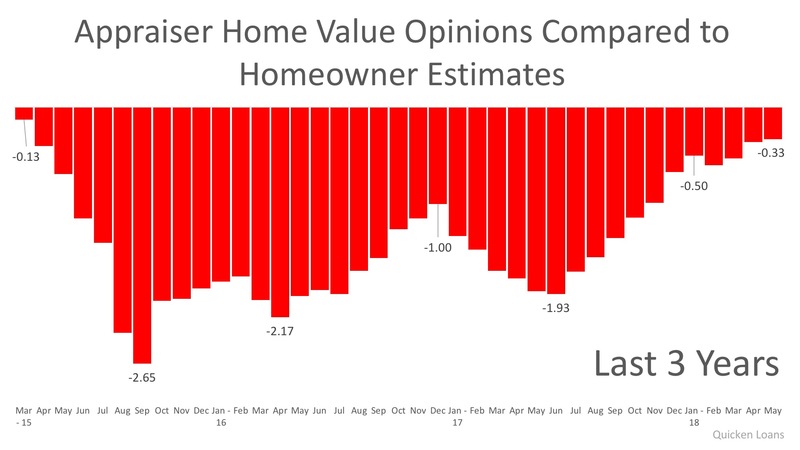 Many experts are projecting that home values could appreciate by another 5% (or more) over the next twelve months. One major challenge in such a market is the bank appraisal. When prices are surging, it is difficult for appraisers to find adequate, comparable sales (similar houses in the same neighborhood that recently closed) to defend the selling price when performing the appraisal for the bank. March 2015 marked the first month of a three-year gap between what an appraiser and a homeowner believed a home was worth. That gap widened to 2.65% in September 2015 and had consistently hovered between 1.0% and 2.0% through November 2017. In the latest release, the disparity was the narrowest it has been since March 2015, as the gap between appraisers and homeowners was only -0.33%. This is important for homeowners to note as even a .33% difference in appraisal could equate to thousands of dollars that a buyer or seller has to come up with at closing (depending on the price of the home). Every house on the market must be sold twice; once to a prospective buyer and then again to the bank (through the bank’s appraisal). With escalating prices, the second sale may be even more difficult than the first. If you are planning on entering the housing market this year, let’s get together to discuss this and any other obstacles that may arise. Previous: Previous post: 4 Steps to Follow When Presenting an Offer in Today’s Market! Next: Next post: Did Tax Reform Kill the Luxury Market? NOT SO FAR!